Interview w/ Cantina Primo Re Winery, Salento, Puglia Italy. Interview w/ Cantina Primo Re Winery, Salento, Puglia Italy. When was the idea for Cantina Primo Re originally conceived? Since Nicola and I met in 2009 [in Argentina, where Natalia is from], we’ve always dreamed of having a small business to run together, and to avoid working for other companies. Because of Nicola’s strong passion for wine (that I quickly learned to share), it was an easy decision to open a winery. We had the [family] vineyards, we had the qualifications and international experience (Nicola holds a master degree in Viticulture and Enology), and we had the spirit. But we didn’t have the money! As a non-Italian, what has your experience been with the infamous Italian bureaucracy? Everybody thinks it is hard in their own country, but I’ve lived on several different continents, and can say without question that nothing comes close to Italian bureaucracy! Honestly, it’s the worst part of being in Italy. Our wines are ready to go, carefully aging in barrels until the day we bottle and launch them in the market. Which was supposed to happen in August. Then in September. Then we had to say October. Do you know when we’ll be able to finally put our wines in the market? MARCH 2017. For several reasons – hard to understand and even harder to explain – we won’t have the authorization for starting the commercial activity until next spring. We HOPE. A funny note: the only easy thing we had to do before launching our wines was getting registered by The Vegan Society. Do you know why was it simple? Because they’re British!!!!! Whatever step does not include Italians is a piece of cake! Apart from the bureaucracy, what were your biggest challenges? Another challenge for us was launching organic wines that were suitable for vegans and vegetarians. We’re not the only ones that produce organic wines in Puglia, but we’re one of the few organic wineries in the area. It’s not the same to produce 20 different wines, of which one is organic, than to be completely organic. In our case, not only the vineyards but our olive trees, our vegetable lands, and even the aromatic herbs I grow in the garden. We produce ONLY organic food. I don’t understand these industrial wineries that launch an organic line of wines. What’s the point of growing one hectare of organic vineyard, if the other ones are not? It shows that they don’t actually believe in sustainable agriculture; they just do it for commercial reasons. So the big challenge is to help our customers understand this difference, and how dedicated we are to all details and producing only high quality, healthy wines. Why is it important to you to have vegan wines? We shouldn’t have to talk about “vegan wine”; it’s like talking about “vegan lettuce”. Wine is a grape derivative, so shouldn’t it always be ok for vegans and vegetarians? Yet we do, because many wineries – and this is something that a lot of people ignore – use additives and ingredients of an animal origin to produce wines: albumin, gelatin, isinglass, some lysozymes, etc. So a vegetable product, a derived from grapes, becomes something else. This forces us to demonstrate that our wines had none of these additives inside, because we want to ensure to everybody – not only vegans; we’re not even vegan ourselves – that our wines are made from grapes and nothing else. That’s why we registered our products with The Vegan Society, the oldest and only international association that created the word “vegan” in the ‘40s. Though there’s certainly a winemaking tradition in Puglia, one could argue it’s more known for bulk wines than fine wines. What is your take on the area as an up-and-coming spot? We have in Puglia one of the largest areas of vineyards of all of Italy, and it’s true that traditionally wine growers have chosen quantity upon quality. 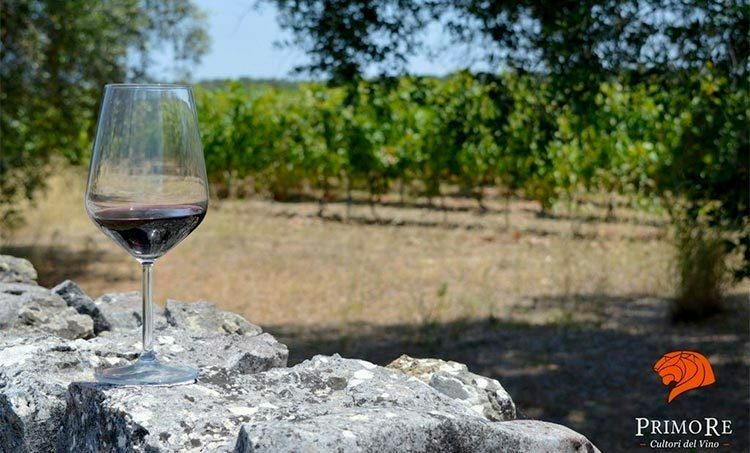 Historically, many northern Italian wines were blended with juice from Puglia, which offers high natural sugar levels and adds structure, body and flavor to wine produced in colder areas. This situation, however, started to change around 20 years ago, when many producers from Puglia began to understand that that our land has everything to produce high quality wines. Now there are many excellent wineries that produce only fine wines, and people are recognizing them more and more. And we’re proud to be part of this movement! You originally went to Veterinary School. Did you ever think you’d be opening a small winery in southern Italy? Absolutely no! Wine wasn’t even that important for me until I met Nicola. What I did now is that my previous career wasn’t making me happy. I used to be a researcher who worked in laboratories, and staying inside a lab all day was killing me. I dreamed to work in the fields, with livestock, but it’s very difficult to get a job like that when you’re a woman, at least in Argentina. One day I just decided that my life so far wasn’t the kind of life I wanted to live, and gave up everything. I quit my jobs and started a journey – literally and spiritually as well – that took me to live in different countries, with different people and made me realize that what I really wanted was to have something of my own to grow and take care of. Something that represents a real challenge where it’s up to me (or us, in this case) whether it succeeds or not. That’s what Primo Re Winery is today: a big challenge and the more important project so far in my life, where I can put all my effort and knowledge. What, if anything, from your previous career are you able to apply to this new one? A lot of things! Obviously not my knowledge of medicine, but as a Vet I was quite atypical anyway. I used to write a lot of projects, papers, presentations, and learned English as all researchers must do. I’ve been writing since I was a kid and it’s one of the things I enjoy the most (as you can see….!). I also have strong computer skills and I’m very practical and love problem solving – a consequence of my previous career. Vets have to solve problems quickly and effectively, as there is rarely time to lose. So for Primo Re, I created the whole brand concept, the graphic & marketing material, and developed the website and e-shop. I also manage all the social networks and wrote 100% of the words that you will read about us. We saved a lot of money actually because we split all the tasks: Nicola works in the vineyards and the winery, and I do all the brand and communication. So far it’s working! What’s the most surprising thing that happened along the way? We were amazed – and still are every day — by the great response we’ve gotten from people that believe in us and joined this project since the beginning. I’m talking specially about our Wine Club (“Cultori del Vino” — wine lovers), that we have developed through our social networks. It’s a different concept; a wine club where the emphasis is not on sales but on building a community of wine enthusiasts. I posted things like “Do you love wine and writing? If yes, contact us“, and started to receive emails from the curious. I didn’t know what to expect, but I could not believe the large number of emails I received! I explained early and often that it wasn’t a job offer, so people that wrote me were just looking for fun, not money. I even met one of our film reviewers thanks to this post, and coincidentally she lives in a town near to mine. We’ve become friends. There’s much more that you’ll see when our full website goes live; stories of wine and food, content about related books, music and movies. The key concept is that ALL this content is created BY wine drinkers themselves, not FOR them. This is not for selling wine, but for creating a club of people that shares our love for wine — 300 so far and we still don’t have a bottle to sell. I knew it was a good idea — I’m passionate about the sharing economy — but I’m extremely surprised and satisfied about how fast this idea was understood. I guess people like our ideas! Thank you very much Mike for talking about us! It’s a pleasure for us to tell our story to our American friends. You’re all invited to discover our warm and lovely Puglia, and specially to taste our wines!